I know it's silly, but when my students forget to bring a pick to a guitar lesson, I present my box of assorted picks and say, "Take Your Pick!". Ha ha! It almost always brings a smile to their face, plus I get to launch into my "What's the best pick for you?" routine. When I say I am not exaggerating about the number of different guitar picks, there really are thousands of different picks. There is even a book about picks, aptly called Picks: The Colorful Saga of Vintage Celluloid Guitar Plectrums, by Will Hoover. If you want to look at lots of pictures of different kinds of picks, you should pick up this gem of a book. I confess I've never read the book, but the pictures alone are worth the purchase price. It's absolutely crammed with photos and text about plectrums: Big picks. Little picks. Colored picks. Weird picks. The book is one-hundred-and-seven pages of the most fascinating facts and photos of picks. Take a look at the photo above. These are some of the picks in my personal collection. Every once in a while I visit a music store and buy a dozen or more picks of various sizes and shapes. I don't personally use many of them, but they are good to show students who may not have seen many picks. 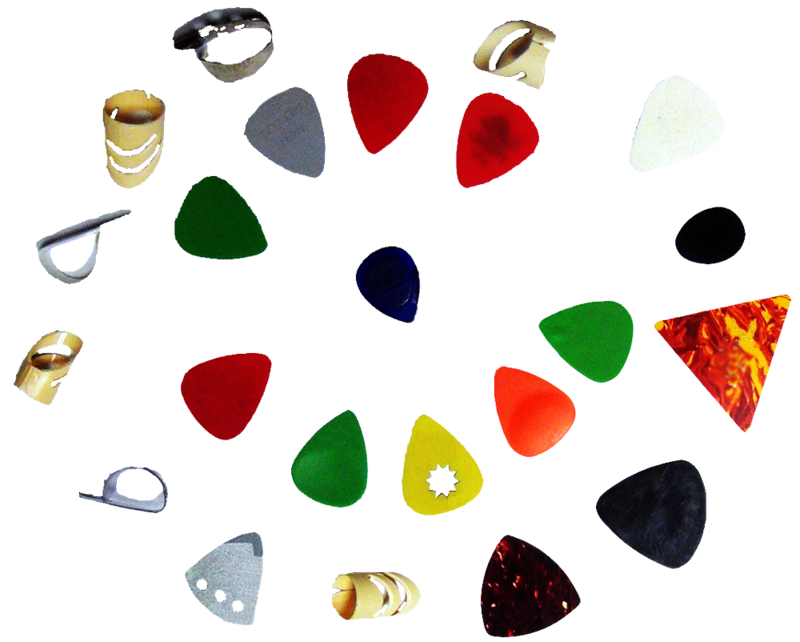 So, given the almost infinite variety of guitar picks, how do you choose the right pick for you? The first thing I usually tell people is to go to a music store and buy a bunch of picks. Then try them out. You'll probably find some that work well for your particular body type and playing style and some that don't. The truth is that there is probably not a single pick that could be said to be the "the perfect one". There is just too much variety when it comes to guitars, styles, and body types. One pick may work well for strumming while a different one will work better for picking individual notes. Let me try to give you some common attributes associated with different kinds of picks. In general, thick picks sound louder, "darker", and offer more resistance to strumming. Thinner picks produce less volume, tend to be "brighter", and slice through the strings easier. I know players who like thick picks because there is less "give" - you do not have to compensate for the flexing that happens when you pluck a string. (I fit into this category.) In the extreme, thickness versus thinness would be like using a hammer with a metal handle as opposed to one with a soft rubber one. You can get a lot of volume out of a thick pick. 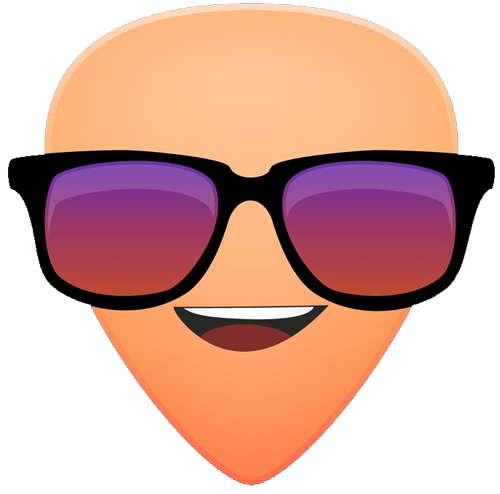 However, a thinner pick will produce a brighter sound and will not offer so much resistance when strumming. Pick size is mostly about matching the size of a person's hands. Bigger picks are probably better for people with bigger fingers, while smaller picks fit smaller fingers better. However, I believe smaller picks enable more flexibility when strumming: you can strum using just fingers, hands, arms, or combinations of these three. Well-trained players learn that they can pick using just the finger and thumb tips, only wrist action, or just the forearm - or they can strum using a combination of two or three of these techniques. A pick that is too big does not allow the tip joints of the finger and thumb to flex as well as a smaller one does. My recommendation is that a pick should not be bigger than the distance from the tip of the finger to the joint nearest the tip - bigger than this and your finger and thumb cannot bend easily. Personally, I have been using Jim Dunlop brand "Little Stubby" picks for many years now. (The pick in the middle of the photo above is a Little Stubby 3 mm thick pick - my personal preference.) I have also noticed that many good players use smaller picks. They are better for children too. But if a larger pick seems to work for you, go for it. If you have a physical limitation, such as numbness in your fingers, a bigger pick might be easier for you to grip. Greater surface area gives you more to hold on to. 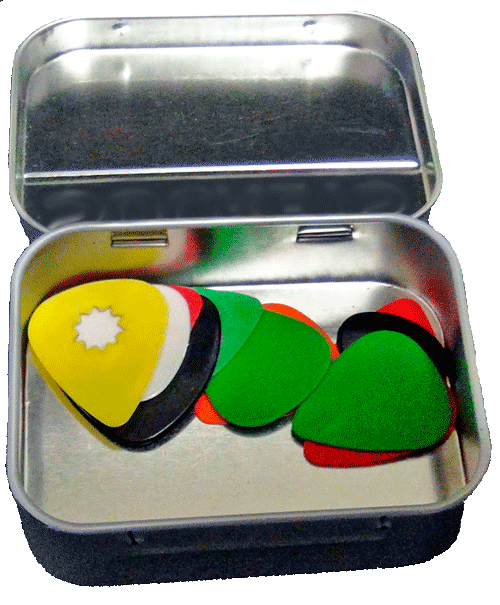 Picks are generally made of plastic but you will also find some made of felt, metal, or other materials. It is hard to generalize how different materials respond. Felt picks are hard but produce a softer, darker tone. Metal picks are louder and brighter. Wood picks are hard but sound dark. This is an aspect of pick construction that defies categorization. Early in my teaching career I taught someone who had lost some of the feeling in his fingers. He found that drilling holes in his picks improved his grip. If you look again at the top photo above, you will see a yellow pick with a hole in the shape of a star; this hole will likely make it easier for you to grip the pick and give you more tactile feedback. 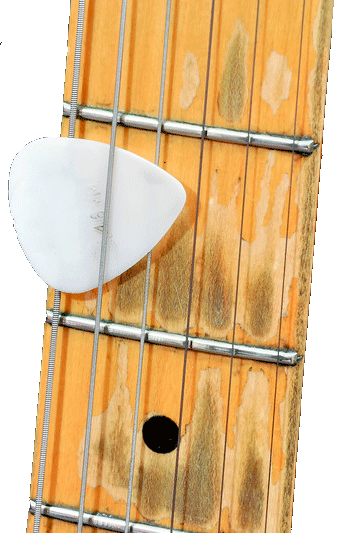 Some picks have cork, rubber, or textured surfaces that help with maintaining your hold on the pick. There are also various products that can be applied to the finger and thumb to improve your grip. Some of these products no doubt contain rosin. A dose of baby powder on the finger and thumb may work well to counteract sweat that may make holding a pick tenuous. My favorite product of the "sticky" kind is "Guerilla Snot" - not necessarily because it works better than other similar products, but because the coolness factor of having green "snotty" looking gunk to rub on your finger and thumb makes it especially popular for young male guitar players - heck, maybe any male guitar player! Beginners tend to have picks fly out of their hands more than experienced ones do. Why? I believe that experience teaches players to constantly adjust the finger grip while you are strumming: If the pick starts to slip out, a good player will quickly and unconsciously adjust their grip. Jeff Anvinson, owner/operator of JLA Music.